Crawl space humidity has been plaguing homes in Ontario since the first day they were built. We offer free crawl space repair quotes in Chatham, Sarnia, Windsor, London, St Thomas, Stratford, Windsor , Essex, Amherstburg, Strathroy, Leamington, Goderich, Ingersoll, Kingsville, Listowel, Hanover, Aylmer and many areas nearby. To schedule your free appointment, call or e-mail us today! As the Mold and rot increase, and animals begin to live (and die) in your crawl space, odors will begin to rise into your home along with the crawl space air. Mold spores are a known allergen, and they can significantly affect anyone in the home who suffers from asthma or allergies. Fortunately, controlling crawl space humidity is easy! At Advanced Basement Systems, a crew of our crawl space contractors can usually install a moisture control system in less than a day. We recommend starting by sealing those crawl space vents, then following up by installing a crawl space vapor barrier on the walls and floors. A dehumidifier is a great finishing touch, drying out the space and helping you to best preserve your home. At Advanced Basement Systems, crawl space repair is our specialty, and we'd like to show you why we're the best. To help you decide which repairs are best for you, we offer free crawl space repair quotes to homeowners in our area. 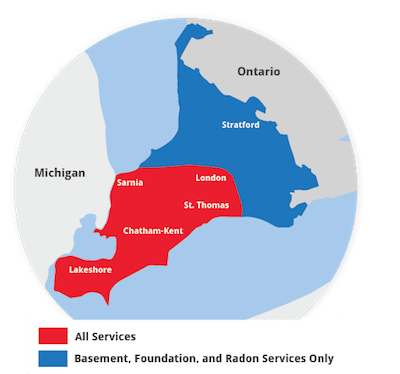 We serve Ontario, including Chatham, London, Sarnia, Windsor, Stratford, Windsor , Leamington, St Thomas, Amherstburg, Strathroy, Essex, Ingersoll, Kingsville, Aylmer, Goderich, Hanover, Listowel and many areas nearby. To schedule your free quote, contact us today!